Dramatically increase the WOW Factor at your event by hiring a “NEVER seen BEFORE stunt” from a unique world class entertainer. Note: Your event goers will have never seen a show like this before! It involves the bizarre and fabulously weird stunt that allows members of the audience to climb inside a giant 6 foot latex balloon! 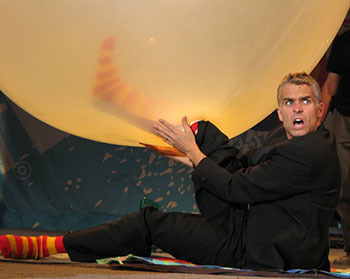 Special events comic daredevil James Johnson has spent the last decade traveling around the world entertaining thousands of people in Fiji, Dubai, Qatar and China and of course North America! His World Record Balloon Stunt has been featured on the Discovery Channel and has been in countless TV and radio broadcasts around the globe. James Johnson has become a hilarious highlight at events for one special reason. It’s downright funny and interactive. James primes the audience with a little comedy magic to lure audiences in before the big balloon finale. Altogether, the show is performed with upbeat music, fun props and a pleasing personality that all ages seem to love. People at your event will enjoy themselves and laugh desperately trying to keep up with the high energy enthusiasm. NOW is your chance for you to have peace of mind hiring tried, tested and true comical experience that spans over 10 years. James no doubt has the experience and proven track record event organizers are looking for. Catch James mastering his craft seamlessly integrating audience participation and hilarious comedy into a proven show he calls the “Magical Daredevil Comedy Show”. Noteable Entertainment & Events is a Vancouver based booking agency, party rental, entertainment services and event production company. If you are interested in booking James Johnson please contact us.